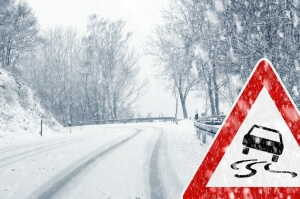 Cold, icy winter weather can cause problems with how your vehicle runs and handles. It can also present new challenges to your driving experience, especially in Denver where freezing and snowing conditions can make the roads more treacherous to navigate. To help you reduce your risk of a winter car accident, here are some important tips for how to safely operate vehicles in extreme weather conditions. Warm up your vehicle prior to driving – Let your vehicle run and warm up for about five minutes or so prior to driving it. Only do this outside of an enclosure (to avoid the buildup of CO). Taking the time to warm your car can prevent engine (or other equipment) failures while you drive. Keep your gas tank at least ½-way full – This habit can reduce the risk of the gas line freezing. If you end up stuck on the roadside waiting for assistance, having at least half a tank of gas can also give you the fuel you need to run your vehicle for warmth as you wait. Drive 5 to 10 mph slower – Slowing it down during the winter is important to being able to maintain control of your vehicle, especially when the roads are slick. Be careful when accelerating/decelerating – While you should drive slower in general, also avoid trying to quickly accelerate or decelerate your vehicle during the winter. This can result in the loss of traction, which can increase the risk of a crash. Double the headroom you leave between vehicles – This will provide you with plenty of stopping room if or when you need it. After all, you never know how attentive, sober or careful other motorists may be. And it can be far more difficult to stop vehicles on wet winter roads. So give yourself this extra stopping cushion. Give snowplows plenty of room – Plows commonly share the roads with motorists in the wintertime, and it can be difficult for plow drivers to see vehicles around them. So, don’t drive too closely to plows if you are sharing the road with them. Don’t use cruise control on icy roads – This can reduce your control over a vehicle, potentially making it more difficult to turn off this feature when there is a loss of traction with the road. Check the weather before every trip – This habit can help you stay informed about any extra risks you may face when heading out on the roads. While you may want to re-plan your course if a storm or other adverse weather is expected, it can also be wise to put off your trip until the weather and driving conditions are safer.